The regular meeting of the College Equal Suffrage league was held yesterday afternoon at the Y.W.C.A., President Mrs. Henry W. Cole, presiding. Dr. Florence Mannion was elected financial secretary of the league. 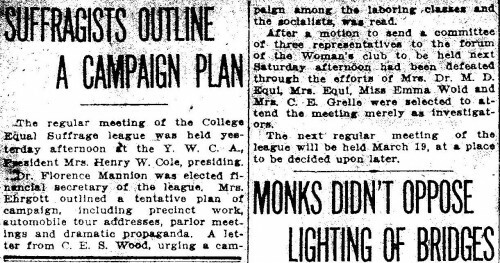 Mrs. Ehrgott outlined a tentative plan of the campaign, including precinct work, automobile tour addresses, parlor meetings and dramatic propaganda. A letter from C. E. S. Wood, urging a campaign among the laboring classes and the socialists, was read. 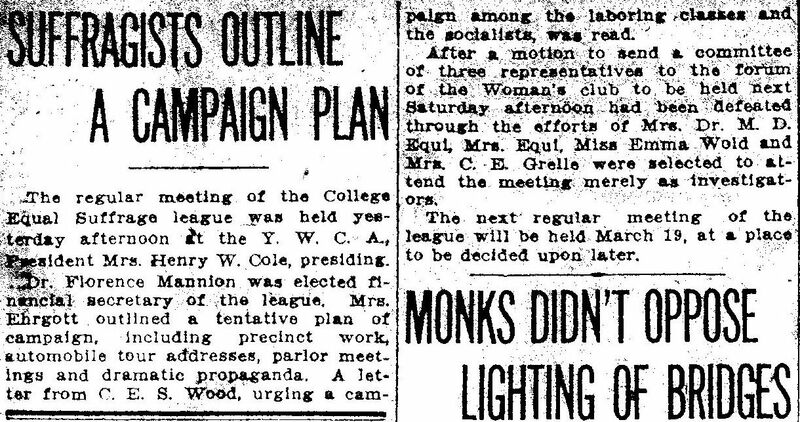 After a motion to send a committee of three representatives to the forum of the Women’s club to be held next Saturday afternoon had been defeated through the efforts of Mrs. Dr. N. D. Equi, Mrs. Equi, Miss Emma Wold and Mrs. C. E. Grelle were selected to attend the meeting merely as investigators. The next regular meeting of the league will be held March 19, at a place to be decided upon later.